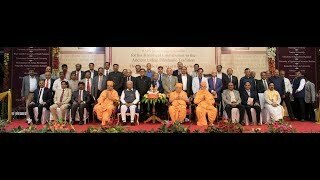 The Governor of Karnataka, His Excellency Vajubhai Vala, together with the vice-chancellors of 35 Universities and representatives of 5 universities felicitated Mahamahopadhyay Swami Bhadreshdasji at the Raj Bhavan, for authoring two unique contemporary Sanskrit texts: ‘Swaminarayan Bhashyam’ and ‘Swaminarayan-Siddhant-Sudha’. India’s rich intellectual heritage is decorated with commentaries (bhashyas) on the Prasthantrayi – the Upanishads, Brahmasutras, and Bhagavad Gita – by Shankaracharya, Ramanujacharya, Madhavacharya, and others to establish the Advaita, Vishistadvaita, Dvaita and various other schools of Vedanta philosophy. Baldev Vidyabhushan, a 19th century follower of Chaitanya Mahaprabhu’s Achintyabhedabheda School of Philosophy, is considered to be the last author of a bhashya on the Brahmasutras. Now, in the 21st century – inspired by HH Pramukh Swami Maharaj and blessed by HH Mahant Swami Maharaj – Bhadreshdas Swamiji has advanced this tradition by writing a commentary on the Prasthantrayi to elaborate upon to doctrine of Bhagwan Swaminarayan, known as the Akshar-Purushottam Darshan. This is not only the first novel bhashya written after 150 years following Baldev Vidyabhushan, but, after Shankaracharya’s bhashya, this is the first time in 1,200 years that a bhashya has been written by one author on all three texts of the Prasthantrayi. Furthermore, Bhadreshdas Swami has written the ‘Swaminarayan-Siddhant-Sudha’ – a vadagrantha that offers an exposition, justification and defence of the philosophical principles. This is the first time in the history of Vedantic literature that a vadagrantha has been written by the Prasthantrayi-commentator (bhashyakar) himself. Thus, the creation of these texts by Bhadreshdas Swami is considered by many scholars to be this century’s most important work in Vedanta philosophy. Hence, he has been honored for his work by numerous educational institutes with awards such as Mahamahopadhyay, Vedanta Martand, Darshan Kesari and Abhinav Bhashyakar. Thereafter, Jnanvatsal Swami delivered the vote of thanks to the vice-chancellors and guests for arranging and attending this special event. On this occasion, ‘Atindriyatva’, a Kannada translation by Smt. 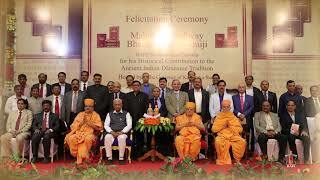 Girija Sastry of ‘Transcendence’ – a book written by India’s former president, the late Dr APJ Abdul Kalam, on his divine experiences with Param Pujya Pramukh Swami Maharaj – was also inaugurated by the governor and the vice-chancellors present.